"War is hell," William Tecumseh Sherman is to have said in 1879, perhaps ironic given his introduction of "hard war" against the Confederate states which saw widespread destruction of civilian infrastructure and supplies during the American Civil War. On a more individual level, war creates a good many foxhole philosophers who perhaps understand that hell better than most of us could, with every good and evil under the sun and night sky hashed out by soldiers over the millennia. Playwright David Mamet's Three War Stories is a collection of three novellas which examine a variety of topics from the perspective of three soldiers stretching from the 19th Century to just after World War II. Everything from religion to forgiveness are examined by the protagonists, and all written with Mamet's usual incredible ear for dialogue – though in this book that doesn't always serve him well. The first entry in the collection is entitled The Redwing and is written in the literary style of the 19th Century memoir. It is the story of a man who began his career as a seaman, transitioned to serving as a spy, before finally becoming an author and loosely basing a series of popular novels on his adventures. Notes on Plains Warfare comes next and are the memories of a man who served in Phil Sheridan's Indian Wars of the 1860s and 70s. Ending the effort is the shortest of the three stories, The Handle and the Hold is tells the story of two Jewish war veterans who smuggle a plane load of weapons and ammunition to Palestine just before the Israeli War for Independence. Unfortunately the quality of the three stories varies, beginning weakly with The Redwing's primary character comparing and contrasting his novels with the reality of his service and the occasionally horrific choices that needed to be made. It is a story which sees an older man look back at his military career and gauge the many ways it changed him, for better and worse. It's also a difficult story to get into thanks to the formal language and the unfortunate fact that it was difficult to make a personal connection with him. Three War Stories begins to pick up speed with Notes on Plains Warfare with its exploration of religion and culture by a veteran of the Indian Wars. Although again adopting an older style of language, it is more accessible and the protagonist somewhat more relatable – particularly when he compares plains warfare to poker, something that many soldiers would probably relate to. For those expecting the incendiary style of dialogue that Mamet long ago became famous for, they will likely be most satisfied by The Handle and the Hold – which philosophically is the slightest of and shortest of the three novellas. Faced with the prospect of flying a stolen B-17 bomber from the United States to Palestine, two Jewish war veterans – one a police officer and the other a tough guy who works a mob controlled casino in Las Vegas – engage in conversation about anything and everything in a machinegun style. Mamet has compared Three War Stories to Hemingway's Islands in the Stream in that each features a collection of stories that are thematically similar but are not connected by an overarching philosophical argument or thread. That may cause problems for some readers hoping for just that but it would do a disservice to what Mamet has accomplished here. Although The Redwing isn't quite successful due to its protagonist's inaccessibility, all three stories do succeed in highlighting the mental aspect of war – both how it transforms soldiers and how they deal with its brutality. Fans of Mamet's intense dialogue driven stories made famous to the mainstream by efforts like Glengarry Glen Ross will likely come away from Three War Stories disappointed. Mamet, however, has never been a one-trick pony by coughing up clever dialogue for its own sake. Serving up rapid-fire conversation, for example, in a 19th Century yarn would have turned the story into a laughable parody. Although the stories differ in the success of their attempts, Mamet employs language as a potent tool in this novella and it's certainly a worthy entry into his canon. 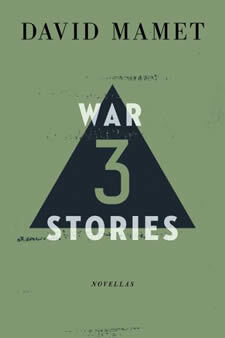 Buy Three War Stories at Amazon.com for only $12.18.